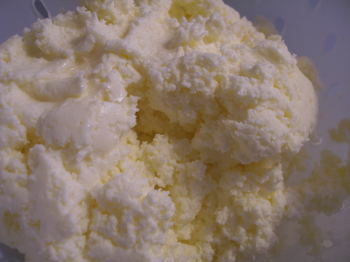 Well, I’m definitely no "ma" Ingalls, but yesterday the girls and I gave butter-making a go. I cannot imagine the time it would have taken to do this by hand. We were lucky enough to have the help of my grandmother’s electric butter churn. 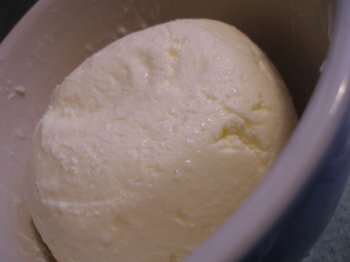 There used to be a jersey cow on the farm that was milked, and my grandmother said she would make butter every day. But those days are past. And Sunday she and I pulled the very dirty, dusty electric butter churn off the top of the refrigerator so the girls could give it a try. The girls were very enthralled by it all, but once we didn’t get instant results they grew a little weary. It turns into this beautiful whipping cream and you think you’re really close, but then it goes back down into a liquid stage. I was ready to give up and assume I had done something wrong, when little bits of butter began forming in the liquid. 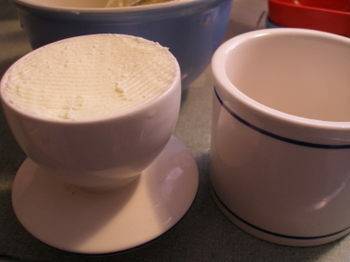 I didn’t have the wooden butter paddles that my grandmother used to have, but using my two rubber scrapers I "worked" the butter to get out all the extra liquid and rinsed it in cold water (don’t know why, just following directions). Then I pressed some into our butter bell and the rest went into a glass dish in our refrigerator. So, of course, I had to make homemade bread for dinner, which I let rise by the fire. (Ma would be proud). "Can I please have some of the GOOD butter from the store?" Ahhh, hysterical! Emma, you’re a smart cookie. Good butter, ha! There’s a *lot* to be said for living in the year 2007, huh? Bet you had fun, anyway (especially knowing that if all failed, there would be “good butter” in the fridge). The very best butter – I guess something beats homemade. This is one of those zingers that will be great to share with her when she is older! Too funny! It sounds so yummy. ah, emma.i’m wondering if you did salted or unsalted? that looks like fun – we’ll try it next year for history! 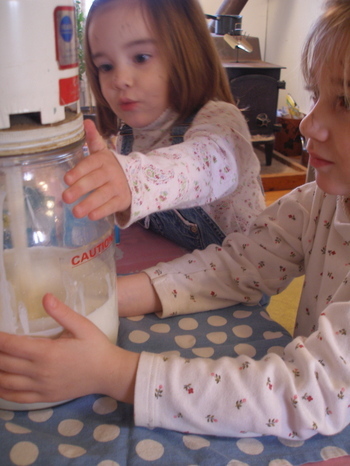 We love doing this – and for those who don’t have a great old fashioned machine – we do it with a ball jar, whipping cream, a (clean!) marble or two, and I definitely add salt at the very end. It takes a long time of shaking (great on those cold, dark days when you need to get rid of excess energy) – and of course, they think that butter is FAR superior!Way to go Ma Ingalls! Looks good from here. More butter for you I guess. That is too too funny! I was getting all dreamy about yummy hot bread and homemade butter- leave it to the little ones to keep our feet on the ground! Priceless! I used to work at a place where they made honey butter- just added honey to butter and mixed it around. It was so good. What fun, homemade butter! We love the Little House books around here too! Homemade butter + bread sounds so yummy. Emma’s comment about the “good butter” is so funny! look at you! i am impressed. I’ve got to find the recipe my oldest daughter used to make butter in school by hand in a ziploc baggie. It tastes wonderful, but of course there was 20 plus kids helping so I’m sure no one got tired of smashing the bag like I tend to do. I usually just pass it to the kids for sometime to play with it and it turns out great for an evening meal. What a poop! Though, she sounds much as I would have at her age! kids, they can just cut right to the heart of things dont they? i would love to come over for a slice of warm homemade bread and butter, sounds like heaven. carb heaven. my favorite. I remember making butter at school when I was about 6.The whole class of 20 or so took turns in shaking the jar.It took all day!! !It’s one of my best school memories though especially as our teacher baked us scones and brought some of her homemade jam. wow, impressive…homemade butter! I love your little butter bell. I recently saw how these work on tv and now I want one. I guess my ebay addiction is not ending anytime soon! Do they really keep butter fresh for upto one month?!?! Cheers! My mouth is watering at the thought of fresh baked bread and fresh churned butter. I love butter,and will never give it up. Mmmmm….I bet it tasted heavenly compared to the store bought stuff. I’m actually drooling. Butter is one of my favourite things on earth.Your daughter is too funny! My son feels the same way about mac and cheese…I make a delicious version from scratch with good quality (expensive!) cheddar and he still wants the junk from the box that my in-laws make for him. Oh, funny. Your Ma Ingalls comment and the earlier post about your daughter loving the first Little House book made me remember: when I was about 9 or 10 & seriously into both the LH books & t.v. show (because yes, I’m that old), I once took the big tub of margarine spread from the fridge and “churned” it all up, in my attempt to make real butter. I’m glad your girls got to experience the real deal, even if it wasn’t “good” to them. That is so funny! Emma’s a cutie. We used to make butter when I was in girl scouts in a jar. We’d all take turns shaking it up. It must have taken forever, but now I don’t remember. You make an excellent Ma Ingalls – and I’m thrilled that you’ve taught me something new… I had NO IDEA that such a thing as an eletric churn existed. How incredibly cool is that…. i found it funny in that book when ma was makingbutter and taking the time to put it in those littlemolds just to make it prettier. it is great to thinkback then they had time to do such frivolous thingswhile they were managing to survive daily, right? I have made butter with two of my classes at school – they love it – then we made scones with the butter and then put the butter on the hot scones! Very popular!!!!! What a fun post! Emma’s not so ready for life on the frontier then, ay? :)I don’t know if I’d want to eat it either though. How did it taste? Ha! Don’t you just love that! I have been making homemade hot chocolate, which I think I SO much better than pre made mix. My daughter finally broke down and said she likes Swiss Miss better. Ugh! I tell you-kids have no taste. ;)At least not GOOD taste. I remember making butter as a kid. I loved it. The end result. NOT making it. As I remember it took much longer than I wanted to spend churning. I was done after like 3 minutes and my Gramma alwas finished it. But it was heaven on fresh baked bread! Hum ! Cela donne tellement envie, du beurre frais ! Yum!I know what you mean by the istant gratification thing. We tried to make homemade ice cream in a coffee can. After about 10 minutes of rolling, shaking and kicking the can, everyone was tired and just wanted pie.